We've been losing musical heavyweights at an alarming rate this year. The latest notable singer to pass away is Herb Reed, the founder and one of the original members of the group The Platters. He was 83. Reed named his group after the slang word DJs called records back in the day, which was platters. 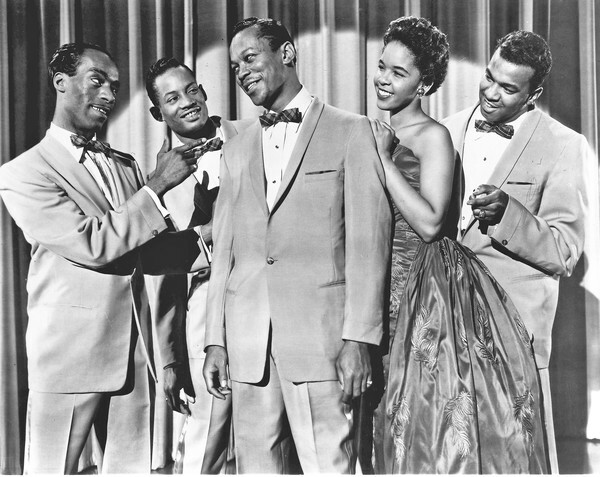 My mother and I saw a younger group perform a couple of years ago who called themselves The Platters; not sure if they were in any way affiliated with Reed, but they performed all of their hits including Twilight Time, Only You, Smoke Gets In Your Eyes, The Great Pretender and more. What I remember most from the show was how the audience literally swooned when they began Only You -- a song that was later covered by Ringo Starr and Diana Ross, among others. It seems good old fashioned love songs are becoming harder to come by, especially on today's modern radio stations. So with that, today's Two Forgotten Friday Favorites is dedicated to The Platters. RIP Herb Reed. Thanks so much for posting this. I still cherish playing my mom's LP as a kid. There were so many incarnations of the group... I read today how Bob Welch of Fleetwood Mac died yesterday; at one time in the 1970s the group didn't consist of either founding member. Now that I think of it, this is what Bowser from Sha Na Na has dedicated his life to doing- stamping out those promoting themselves as groups without any of the original members. Thank you Pam. This was very timely. The Platters were my mother-in-law's favorite music. She lived with us for 28 years and would just love it when I put The Platters on for her. She passed away last week and had her funeral yesterday. It was wonderful not only to hear but to see these performances that brought back many happy memories of when she was doing better. I didn't realize this happened! How sad! My father got me into the Platters when we caught them in some kind of B movie on TV. I bought their CD and just fell in love. It's impossible for me not to hear Smoke Gets in Your Eyes and cry a little because it reminds me so much of my dad. I felt so sad when Herb died. The end of an era. Also, the song is featured at the beginning of the 80s horror film Night of the Creeps, so I did a tribute to Herb on the slasher movie group I help run on Facebook! I think horror fans should be aware of these things! I was just listening to a Platters greatest hits CD a few days ago - great stuff.